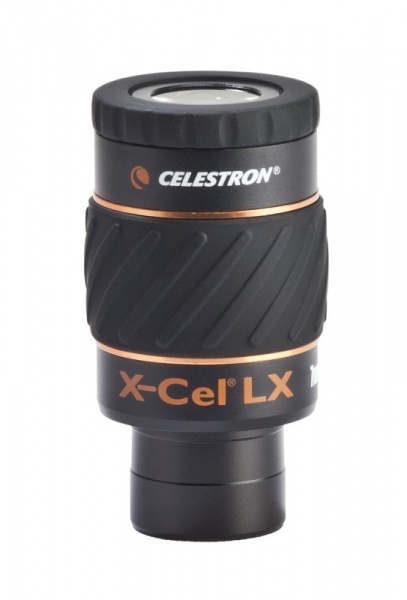 The Celestron X-Cel LX 7mm eyepiece is a 1.25" parfocal eyepiece with six optical elements. The Celestron X-Cel LX family of eyepieces feature several layers of optical coatings to produce the clearest and sharpest images when viewing planetary or deep-sky objects. Celestron X-Cel LX eyepieces are parfocal eyepices, meaning you can swap between any eyepieces within the X-Cel LX lineup and continue viewing with minimal focusing. Manufactured from anodized aluminum with blackened inner edges (for reduced glare), each Celestron X-Cel LX eyepiece has a twist-up eyecup to adjust height and eye relief for different users. A threaded rubber grip around the body of the eyepiece means a sure grip in any condition. Eyepiece barrel is threaded to accept 1.25" eyepiece filters. To learn more about telescope eyepieces, check out our Telescope Eyepiece Guide. OpticsCamp offers free shipping on most orders within the USA. Most orders received before 3PM Eastern Standard Time on weekdays will ship same day either via UPS Ground, USPS Priority Mail, or USPS First Class, depending on cost and transit time. All orders valued under $250 are shipped no signature required unless otherwise requested. UPS shipments valued over $250 are shipped signature required and will not be left on your doorstep. Shipping confirmation is provided via email. OpticsCamp is not responsible for shipping times or transit delays caused by situations outside of our control. Please be aware that your order may be delayed based on stock availability, shipping destination, method of payment, and customs inspections. Expedited shipping is available, but customs delays are common. Once your order ships, it is usually delivered within five to ten additional days. We strive to offer quick and efficient shipping to our international customers, but we cannot take responsibility for shipping delays caused by situations outside of our control, such as customs inspections or carrier limitations. OpticsCamp does not collect VAT or other customs fees from international customers, and any fees incurred due to customs are the responsibility of the buyer. For more information regarding sales outside of the USA, please read our international shipping policy before buying. OpticsCamp will accepts returns of unopened merchandise within 30 days of the original order date. All product returns require an RMA. Removal of UPC codes or serial numbers will void this return policy. All returns must be shipped signature required and insured for the original order amount. Packing material should be similar to the packaging provided in the original shipped order. Please do not write anything on the merchandise packaging. Merchandise that has been opened, mounted, shows signs of wear, or cannot be resold as new may be denied a return. Omission of the original product manuals, packaging, or other product specific materials qualifies a return as used. Merchandise sold as new and returned in this condition will be assessed a restocking fee based on its condition upon receipt. Refunds are normally granted within 3 days of receipt. OpticsCamp may issue refunds via PayPal, a credit to the card used for the original purchase, or via check. Full refunds are only provided given the product is returned within the 30 day return period, in the same condition in which it was sold, with original packaging, product manuals, and manufacturer materials. Shipping charges are not refundable. Once you are granted an RMA, you may contact the following carriers to determine a Customer Counter or Authorized Shipping Outlet nearest your location. Refunds are applied to the payment method used at time of purchase, and are usually granted within 3-5 days of receipt. Full refunds are only provided given the product is returned in the same condition in which it was sold, with original packaging, product manuals, and manufacturer materials. Returned products that do not meet these conditions are subject to a restocking fee. Shipping charges are not refundable. All merchandise is inspected by OpticsCamp prior to shipping. If damaged or defective merchandise is received, OpticsCamp must be notified within 1 business day of receipt and an RMA will be provided. Damaged and defective merchandise will be replaced with a new unit of the same model, and usually ships within 3 business days of return receipt. Any item returned as damaged or defective that is found to be neither damaged nor defective will be subject to a 15% restocking fee. Some products are covered by manufacturer warranties. Product defects that arise after receiving your order should be addressed by contacting the manufacturer or distributor of the product. OpticsCamp will supply manufacturer contact information for warranty claims upon request. Exchanges are granted on the condition that the product being returned is still in new condition, per the OpticsCamp return policy. Free shipping does not apply to exchanges. If an exchange is for a total less than the original order amount, the remaining balance will be held as a credit. Thank you and please contact us if you have any questions!